We just had one class this month, it's just too busy with the holidays. I'm so glad so many of my friends and customers could come and make cards with us! 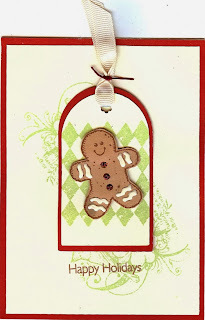 I'm totally copying a card I saw on a blog...but I can't read the watermark on the picture. So sorry, I would love to give you credit, whomever you are! The Fabulous You stamp set has a bird, some flowers and grass. I just used that as a background stamp under my gingerbread man. It also has the diamonds I used on the tag. There are two rows of 6 diamonds on the stamp set, I only wanted 4 of them on my tag, so I made a mask for the bottom of the tag (with a Post-It Note) so I would only get the 4. Have fun playing with paper this week!